Twisted Goods Valentine's Day Goods! Wondering what to get that special someone for Valentine's Day? Twisted Goods has a table full of lovey-dovey goodies waiting for you. 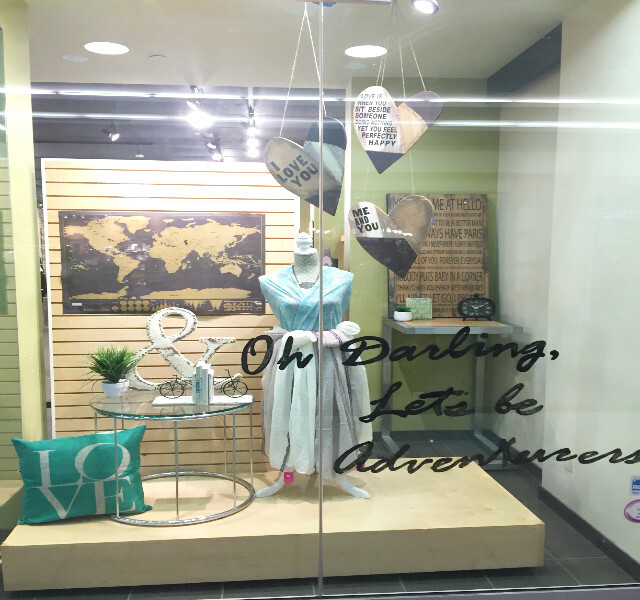 To fit with their theme, "Oh Darling, Let's Be Adventurers", items like selfie sticks, wishing jars, scratch maps, love knots and cedar mountain wall tiles are the perfect gift for your loved one's adventurous soul. Of course, you can't forget about the accessories at Twisted Goods. 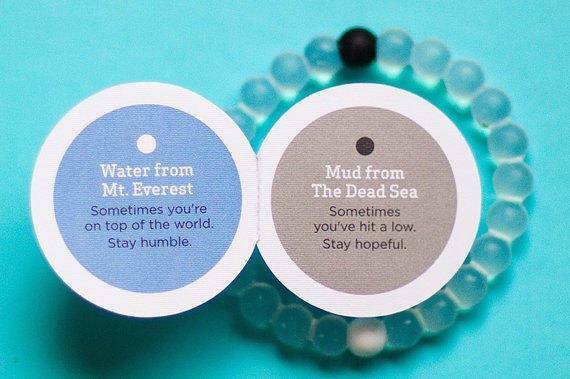 The Live Loki bracelet is a popular item that not only looks good on your wrist, it is made from natural elements from the Earth. Click here for the details on Loki bracelets. How about keeping it personal? 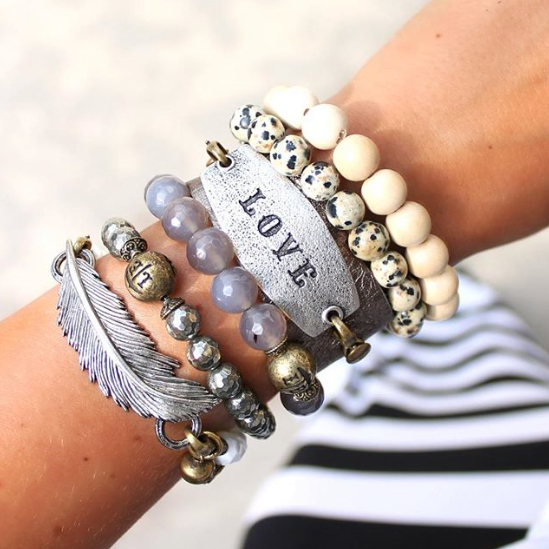 The Lenny & Eva jewellery collection is customizable so you can get the perfect bracelet or necklace. With multiple interchangeable pieces, you can add on for next Valentine's day! You already know that one of the best retirement savings strategies for most Canadians is a Registered Retirement Savings Plan (RSSP)-- and, as this year's RRSP contribution deadline nears, here is a Super Seven list of some of the best ways to get the most of your RRSP. This year's RRSP contribution deadline is February 29, 2016- don't miss it! Always make your maximum contribution each year- that's how to get the most in immediate tax savings and in long-term growth. You will find your contribution room on your most recent notice of assessment from the Canada Revenue Agency (CRA). Fill up unused contribution room. You can do that in a single year or over a number of years until you reach age seventy-one. To have more money in retirement, raise your RRSP contributions as your income rises. An RRSP loan can be a good option for maximizing this year's contribution or catching up on past contributions- but only if the interest rate is low and you can pay it back as quickly as possible. A good way to do that: Use your RRSP tax savings to help pay off the loan. Your maximum RRSP contributions are capped by the government-so to get the additional income you'll likely need to enjoy the retirement of your dreams, be sure to invest in a Tax-Free Savings Account (TFSA) and a wel- balanced non-registered portfolio based on an asset allocation plan that matches your rise profile and time horizon. Choose a beneficiary for your RRSP. Generally, RRSP assets with a beneficiary designation do not form part of your estate and do not attract probate fees. If your beneficiary is your spouse/partner or a disabled child/grandchild, your RRSP can be transferred tax-deferred to your beneficiary's registered plan. Saving for retirement is an absolute necessity- and an RRSP is a great way to do just that when it's part of an overall financial plan tailored to achieve your retirement dreams. 1. Always measure the depth (thickness) of your mattress before shopping for bedding. This helps to ensure your sheets will fit well, and that your quilt or duvet will have the proper drop on the sides of your bed. 2. When washing dark coloured linens for the first time, use cool water and skip the soap. Instead, add 1/2 cup of salt or white vinegar to the water. This helps to set the colour and prevent or minimize fading. 3. Replace your pillows about every two years, or use a moisture and dust mite proof pillow protector to extend the life of your favourite pillow. 4. Always ensure that your duvet and duvet cover are a compatible size. Purchasing a duvet and a duvet cover that are well matched (within a couple inches) in dimensions will help to prevent shifting and frustration! Or try duvet clips to help tame an unruly (undersized) duvet. Have questions? We have the answers! 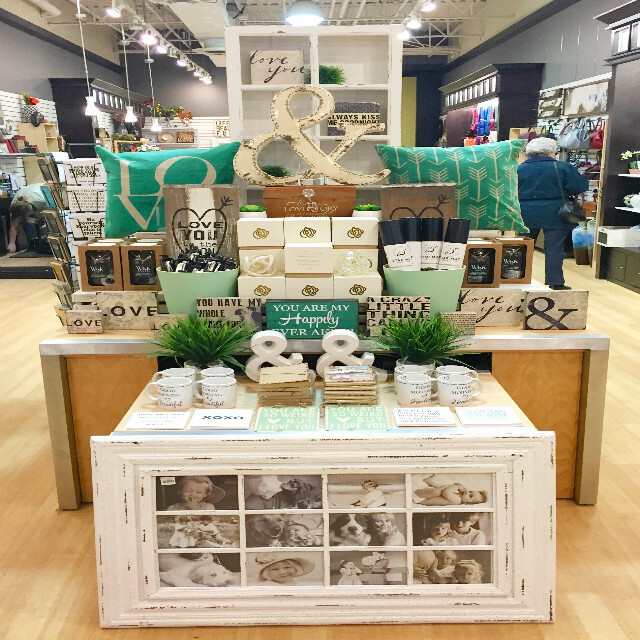 Shop local and let us help you find the best products for your needs and create a beautiful space in your home! From top left: T by Alexander Wang sheer wooly turtleneck, Anine Bing deep V tee, Equipment Adalyn blouse, Rag & Bone Floppy Brim Fedora, Zoe Karssen striped tee, Rag & Bone Newbury booties, Joie Cyrene coat, Rebecca Taylor Cocoon coat, Rebecca Taylor faux leopard coat, Frame Denim shredded skinnies, Elizabeth and James Jena dress. DO NOT advertise on Facebook or other social media that you are on vacation. 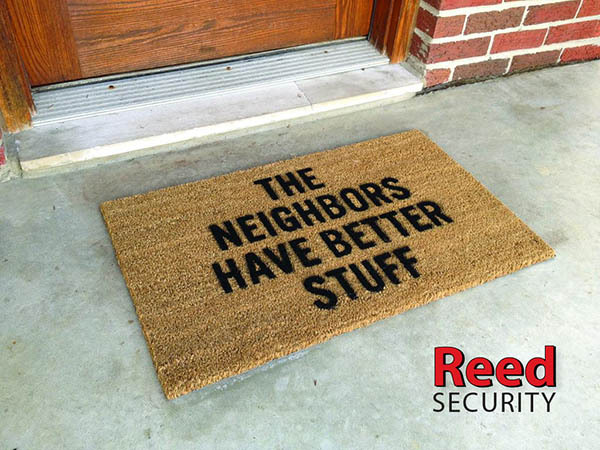 Check out Reed Security's Spotlight Profile for information on location, hours and more! With winter officially upon us, it’s smart to start planning a winter emergency kit. No one wants to think about the unexpected but it is always good to be prepared. Here are a few tips to help you avoid stress. They may also prove to be very important in case of an emergency. When going on long car trips don’t wait until the last minute to fill your car with gas. It is smart to make sure you have at least three quarters of a tank before traveling to reduce your risk of getting stranded in the middle of nowhere with no gas stations in sight! If you get stranded you cannot always rely on your cell phone. Keep in mind that your mobile service may not provide reliable coverage in many rural areas, so you might not have service to call for roadside assistance. Check with your service provider before traveling to identify service holes, and keep spare change in case you need to use a pay phone. The best way to prevent travel trouble is by being proactive. Be sure your car’s routine maintenance is up-to-date. This includes oil changes, tire rotation and pressure checks, along with inspection and registrations stickers. Even the best plans can be defeated by unforeseen weather or an accident. Always have these items in the car in case you need to wait for help to come. Don’t let the winter weather keep you indoors! Be prepared and reduce your risk of travel woes! Twisted Goods is having a winter sale in both Centre Mall and Lawson Heights Mall locations. 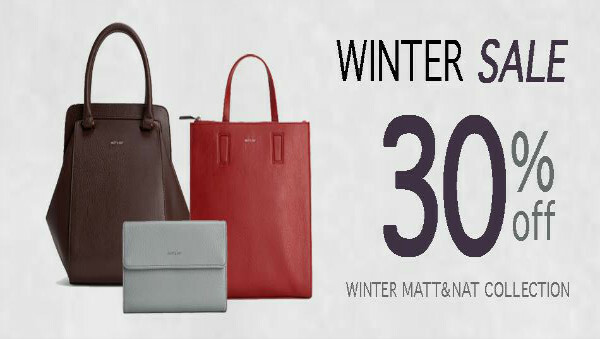 Get 30% off all the winter collection of Matt & Nat bags! 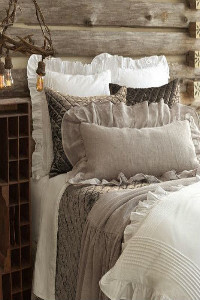 Georgia Mills is having a 20% off all in-stock duvet covers. Hurry in to either the University Heights location or Market Mall to save! 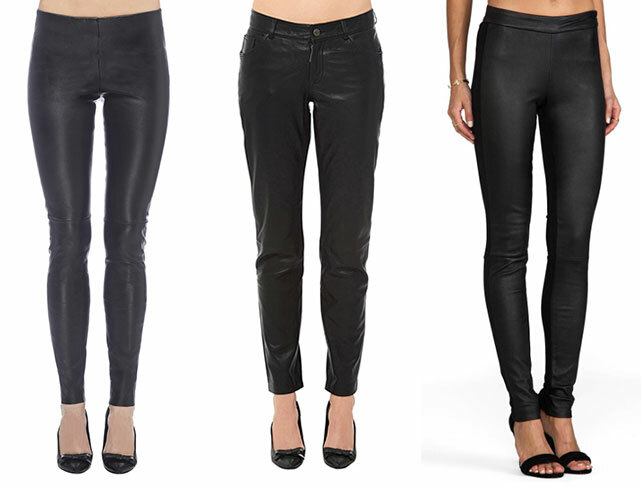 Era Style Loft's latest blog is all about the leather pant trend. Read it to find great inspiration on styling these beauties! Below are the available leather pants that Era Style Loft has in store. From left: Anine Bing leather leggings, Anine Bing loose fit leather pants, 10 Crosby Derek Lam leather leggings. A message from locally owned, Maaco Collision Repair & Auto Painting. Buying your winter tires is an important choice which should be made with careful consideration. Upon buying them, you must also maintain them, which is another important consideration. 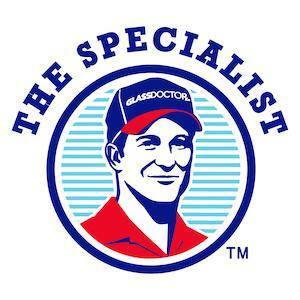 During this segment, we want to offer you some collected wisdom that we’ve gathered from all over the place that we personally swear by, if you’re ever in need of purchasing or maintenance advice. Also in our tips are some common sense strategies that will hopefully have an effect on winter driving in general, and getting used to your winter tires. 1. All-season tires are a bad compromise. On snow, ice or cold pavement, the stopping distance of a car that has winter tires can be up to 30 to 40 per cent shorter than one with all-seasons. The force of a crash increases as a result of the square impact of speed, and this could mean the difference between life and death. 2. Although it’s the treads that a customer buying tires usually notices, the most important part of a winter tire is actually the rubber compound that it is made up of. This rubber compound is designed to stay soft in freezing temperatures. Similar to a gecko climbing a sheet of glass, a winter tire sticks to the road by conforming to tiny imperfections. The weather transforms a summer tire’s consistency into that of a hockey puck. The soft rubber treads of a winter tire are able to splay and wrap themselves around miniscule protrusions on cold pavement, or even on what appears to be ice that is perfectly smooth. Summer tires, which have been designed to operate in warm temperatures, harden as the temperature falls. Although all-season tires must be designed for year-round use, they cannot match winter tires in low temperatures. They still hold a bit of rigidity in frigid weather, though not as much as summer tires, and cannot beat the snow tires’ elasticity, as well as the studs that snow tires can come with. 4. It’s about temperature, not snow. Winter tires must be installed when the customer expects temperatures to fall to 7 C (that’s plus 7!) or below. As the temperature falls, the rubber in summer and all-season tires becomes inflexible, killing traction. Watch the thermometer and use common sense, because no one will tell you exactly when to put on snow tires (except in Quebec, where the law dictates that your car should be equipped with winter tires between Dec. 15 and March 15). 5. Winter tires should be narrower than summer models. Customers have expressed the thought that proper winter tires can look a little like spare tires. Experts recommend going down one or two sizes when installing winter tires – if you car came with 215-millimetre wide summer or all-season tires, for example, your winter tires should be 205 mm or 195 mm. Reducing the width of a tire increases the pressure it exerts on the surface beneath it – this will help the tire slice through snow, and reduces hydroplaning. 6. Winter tires are designed to move water. When a tire presses down on snow or ice, it melts the top layer, which creates a thin film of water. This is the same phenomenon that occurs as a skate glides across a rink, because of the friction created by movement. If the water isn’t moved away from the area in front of the tire, the car will hydroplane. This is why winter tires are covered with grooves (including tiny channels known as “sipes”) that move water away to the sides, allowing the tire to stay in contact with the surface. 7. In the old days, winter tires came with deep, aggressive treads designed to paddle through deep snow. This made for a noisy ride and compromised stability, since the treads deflected under acceleration, braking and cornering loads. Current winter tire technology now focuses on shallower treads with closely spaced grooves that carry away the water film created when the tire presses down on ice or snow. 8. All-wheel drive helps you accelerate, not stop. On slippery surfaces, vehicles with four driving wheels can accelerate better than those with two-wheel drive. But their cornering and braking capabilities are little different than a two-wheel-drive model. When you’re trying to stop or turn, the limits are determined by the traction capabilities of your tires, not the number of driven wheels. 9. Black ice is not a death sentence. In the case of black ice, good winter tires will stick, but only if they are within their traction limits. If your car begins to slide, look straight down the road to where you need to go, and maintain a light grip on the wheel. As the car decelerates, you will gradually regain control as the tire’s rubber begins gripping surface imperfections on the ice. Slow speed and gentle control inputs will maintain traction. 10. The performance of winter tires has been significantly improved over the past decade by advanced rubber compounds that allow designers to make tires softer without sacrificing other critical properties, including wear and heat buildup as temperatures climb. Major manufacturers spend a lot of money on R&D. Jaap Leendertse, winter tire platform manager for Pirelli in Milan, Italy, has said that his company has developed more than 300 compounds in the ongoing quest for the ideal winter tire. 11. Although testing makes it easy to see the performance advantages of a winter tire, the technology behind it is deceptively complex. Tire designers must consider a long list of factors, including tread stability and hysteresis. This is a process which generates heat as a tire repeatedly deforms and recovers as it rotates under the weight of a car. 14. Although it’s not recommended for everyday driving, reducing the air pressure in your tires can help you gain in an emergency. Reducing tire pressure increases the tire’s contact patch, and may help you make it up an otherwise impassable icy grade, for example. Bear in mind that this is an emergency technique only, and will reduce overall control of your car by making the tire carcass less stable. Unless you’re stuck at the bottom of an icy hill with no other option, the inflation pressures recommended by your car manufacturer should be used. If lowering the tire pressure in a winter tire is needed to make it out of an emergency situation, be sure to drive slowly and re-inflate the tires back to the recommended pressure as soon as possible. Driving with lowered tire pressure than is normal can be hazardous if maintained for too long of a period. We hope you are never involved in a collision, but if you are, we are here to help, during and after your car has been fixed, with our Customer for Life program. Please call us at 306-653-5655, or come down to the shop at 659 51st St E, so that we can help you out and get you back on the road. Remember, we can’t prevent an accident, but we can make it like it never happened. Visit Maaco Collision & Repair's Spotlight Profile for more information on location, hours and social media platforms.